BinaryBook was founded in 2015 and under new management by Dastos KGH Ltd and clearing services are managed by Hermes Solution D.O.O., Golubovci B.B. 81000 Podgorica, Montenegro. BinaryBook is unregulated and there is not much information on who they are except for the virtual offshore offices. Be advised, BinaryBook may be shutting down and does not accept new clients. First of all you should know that BinaryBook is not a regulated brokerage. This is a warning sign (I would never put my money into an unregulated broker) but it doesn’t mean necessarily they are a scam. Several online sources (unconfirmed) list BinaryBook as a recommended broker for trading robots such as Free Money System or Quick Cash System and this is another red flag. If you want to deposit with a broker you should do so because you’ve done your research and consider them reliable enough, not because some million-making system recommends that broker. Several people have complained online about BinaryBook’s representatives asking them to deposit more and more money, but as we know, this is a wide spread tactic. However, just because it’s wide spread doesn’t make it OK. After all, if some guy bumped into your car, I don’t think you would be cool with him saying “Dude, it’s OK! Everybody is doing it.”. Now returning to the original question: Is BinaryBook a Scam? Let’s just say that a raised level of caution is recommended. I would not open an account with binarybook. Update October 2016: BinaryBook is a recommended broker by NEO2. In other words, if you sign up for NEO2, you will be asked to open an account with BinaryBook. We consider NEO2 a cheap scam and that says a lot about the brokers they associate with. Read our full NEO2 review here. According to their Homepage, BinaryBook doesn’t accept new clients anymore. However, according to their Live Chat, they do, but only from certain regions. I have to point out that their representative closed the chat session as soon as I started to ask uncomfortable questions. And by “uncomfortable” I actually mean “normal” questions (for you and me) like ”Why are you telling me a different thing than your homepage does?”. Update March 2017: BinaryBook is no longer accepting new clients after a massive amount of complaints and legal action taken in the UK. However, the customer support did not admit they were shutting down. We also noticed that their traffic has dropped as of lately which is not strange since they are not accepting new clients. Overall, we still recommend you do not trade with BinaryBook but they don’t accept new clients anyway so the choice is easy, pick a reputable and regulated broker instead! Notice! : This broker is not recommended due to a large number of complaints. Find users complaints below, continue reading this review or get started with a trusted broker now. Their website and platform are slow and clunky. My computing power is well above what’s needed for a binary options platform to operate and my internet connection gives me 47.27 Mbps download and 58.45 Mbps upload (just tested it before writing this) so I guess someone needs to improve their website. Update 2017: they don’t accept new clients which I should probably have mentioned as a plus since they have been acting as a scam and are warned by many authorities but, yeah, you get the point. They make a fair attempt to keep their website up to date, including Daily Market Analysis. We often see Daily analysis that is outdated for months so it has zero importance for traders but BinaryBook tries (and so far succeeds) to bring fresh content every day, helping their clients. It’s not something amazing but considering that others don’t do it – kudos to BinaryBook. Update 2017: Their market analysis seem to be up to date indeed but they are simply based on an indicator being oversold or overbought and half the predictions were wrong so I wouldn’t put too much hope into that. Should I Open an Account with BinaryBook? At first glance, BinaryBook is not much different than other SpotOption brokers. Unfortunately for them, at second and third glance, they are still not much different. The educational material (videos and e-book) is almost identical to the one seen on the websites of other brokers that use SpotOption and most of it is locked until you register. Just because it’s similar to others, it doesn’t mean it’s bad; if you see it for the first time and you don’t know anything about binary options, it will help you get started. However, you need to be aware that it has a marketing feel to it more than educational but maybe that’s just me. Earlier I’ve told you they have added new features, so let’s talk a bit about them but keep in mind these are built by SpotOption and it’s their merit; BinaryBook simply makes them available to traders. Apart from the normal options contracts (Call/Put, Pairs, Long Term, Turbo, One Touch and Ladder), BinaryBook offers FX/CFD options and Spot Follow. The FX/CFD style is similar to forex trading, where clients can choose their Stop Loss and Take Profit, with the possibility of profiting up to 500%. Personally I believe this style is too complicated and it took me longer than expected to understand how it works (and keep in mind I am a forex trader) so I am not sure how appealing it will be to newbie binary options traders. The 500% might be great but I guess you can imagine it’s hard to get. The Spot Follow feature is actually copy trading. You can chose which trader to follow and you can set limits to the amount used to copy his/her trades. There is some information about the traders you can follow, but in my opinion that information is very thin and not enough for me to put money on the line. If I am going to follow someone, I need to know more about them and their trading/money management style. From afar BinaryBook might seem as an innovative brokerage but when you dig deeper, you realize that most of the extra/new features come with the SpotOption platform. Brokers nowadays don’t seem to shake the copy-paste style and what’s even worse, they don’t seem to want to. All brokers are “number one” and BinaryBook goes as far as saying they focus on “[…] uniqueness”. How can you be unique when you and 70% of all brokers in the binary options industry are using the same platform? Many clients are sucked into dealing with BinaryBook by following get rich quick scams and others have issues withdrawing. Their bonus terms are on the negative side, if you thought 20-40 times the bonus was high, try 60 times!! Therefore, it is needless to say there are many angry complaints screaming scam. Complaints are varying, some are talking about how they got suckered by scams to deposit with this unregulated broker, others talk about bonus terms being so high they will never be able to withdraw. I even saw someone being pissed off about how his personal information was sold to others. 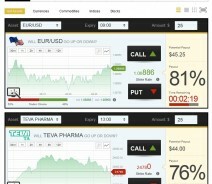 You can find the complaints on Forexpeacearmy, binaryoptions.net, ripoffreport.com and other trusted forums. But it doesn’t end there, apparently, many scammed clients of BinaryBook from the UK have been taking action against the firm – source: thisismoney.co.uk. Clients from the United States are accepted but the website is available in only two languages (English & Turkish) and it takes a long time to load. The overall experience is slow but the SpotOption platform is easy to use and nicely structured. Update March2017: They don’t accept new clients as mentioned above. Trading opportunities can be found of 31 currency pairs, 3 commodities, 12 indices, 22 stocks and 2 pairs. This is a medium sized asset basket but it’s reasonable. The expiry times are characteristic to SpotOption platforms, ranging from 60 seconds to 15 minutes, hourly, end of day and long term. One Touch options (with predetermined expiry time) are also available. Update October 2016: The asset index now lists 16 currency pairs, 38 indices, 7 commodities and 41 stocks but we don’t know how many are actually available for trading. To open an account you don’t have to pay anything but when you want to withdraw money, things change: you will have to pay a charge of 50 USD/EUR/GBP for wire transfers and 25 USD/EUR/GBP for credit/debit card withdrawals. For card withdrawal you will also have to pay a Processing Fee (a fee to a fee???) of 10 USD or 7 EUR or 5 GBP. These fees and charges are way too high for the industry (we recommend reading the Terms and Conditions if you want to open an account). Live Support was reasonable enough, although not the best I’ve seen. The effective return ranges around 80% (medium for the industry), depending on the asset but options styles such as One Touch, Ladder or FX/CFD can bring substantially higher payouts. Update October 2016: Their support representative wasn’t helpful at all, answering a question with a question. The support seemed a bit confused as she did not even recognize their own company owners when I asked about “Dastos KGH Ltd” – she replied that’s not the owner even though the terms and conditions clearly state they are the owners. She then copy pasted the little info there was, the virtual office and the same name I already mentioned to her. There was nothing more about the company she could give me. Be advised, new clients are not accepted. Deposits and withdrawals can be made through wire transfer and credit/debit cards such as Visa, Delta, MasterCard, Diners, Visa Electron, Maestro, Maestro UK (Switch) and Solo. The time it takes for a withdrawal is not specified by BinaryBook so we recommend you ask for written information. Minimum deposit depends on the account type you choose, starting at 1000 USD for a Micro Account and going as high as 50,000 USD for a VIP account. The Bonus is correlated with your account type, starting at 20% (Micro Account) and going as high as 100% for the Platinum Account. The bonus for the VIP account is not specified on the website. The required turnover is extremely high at 60 times the bonus received but in this volume FX/CFD trades are not included. Beware, accepting a bonus means you cannot withdraw any funds at all! FX/CFD and Spot Follow are interesting additions but nothing impressive. On top of that, these features are the merit of SpotOption, but I guess BinaryBook could have opted out of such features thus some credit goes to them as well. Thumbs up for an up to date Daily Market Analysis even if this shouldn’t be considered and extra feature. Hi, I am one of the customers of BinaryBook, my broker’s name is Bradley Ray, I have been trading with them for about 5mths I guess since July. At present, in my account there is about $10800.00. In September, I made a withdrawal request, and they turned me down, and I tried again and was turned down again. Then the broker called me and assured me that I should wait until the end of October, around 28th and I did. A week later, I saw my request cancelled again. Then I tried to talk to him and he is no more the to talk to me. I made more than 10 withdrawal request and always been turned down. Last week I received an email from them saying that I have to much each $1 bonus received 60 times. In other words I have to make 60 × 2400 in other to be able to withdraw my initial investment which is 2500 us. Meanwhile when I signed up, I wasn’t told that that was the deal. Now I am helpless not knowing where to turn to for help. I even told them to keep the profit I have made and just give me back the money I invested and they said I have to meet the terms and conditions of their website. Do you guys have any advice for me how I can get my money back into my credit card account please. Thank you. Made a withdraw for 250 eur, they took 57eur in fees. No one mentioned me that the fees are so high. But called me several times and called me a “my friend”. I was given a so called expert trader who proceeded to lose my money. Hi, i never really trusted BinaryBook in the beginning. I had my reason to believe that this broker was not good as I saw many binarybook scam reviews. Unfortunately, I was wrong to believe that and hey, we all make mistakes. In fact, binary book is very much a good broker, their services are above average and more than 90% of the time, they are here to assist me with any query that I have. Trust me, some brokers won’t even give you 60% of their attention, and they make you believe that they care about you but all they care about is your money. Good approach. See how things work, I hope you won’t have problems with the withdrawal. PS I’m an American, so apparently they ARE taking US traders now. Yeah, my case isn’t as bad as that, but I had a broker telling me I had to borrow a lot of money, but I was hesitant despite all his assurances. I did put in a lot of money from my credit cards, and it looks like after some initial wins, I lost big. I think these people simply can’t make money unless they are working with huge sums and can afford such losses sometimes; they can’t make money on the small commissions from the smaller trades that us poor traders need to make to exercise proper risk management. I opened an account with Binary Book on 3/2/2016 with $500. shortly after making the deposit my phone rings and a voice spoke up telling me that he is now my broker and this is how he’s going to use my money and what I’m going to invest in. “Note” this was the first time that I ever did anything in the way of trading, other then trading a marriage for alimony payment. And boy did I get screwed on that trade also! :-( anyway, This “Broker” somehow talked me into putting $400. in a long term trade, by long term I’m talking about two weeks,and not to worry about a thing, he was so sure he stated that he himself had put 4 separate $2000. trades in. Well two long weeks past to find out that my balance was now at $75. and I guess he and maw bell didn’t work out right neither,seeing that his phone number didn’t reach him anymore! I tell ya if that boy worked any where within 75-100 miles of me,me and my boy’s would of rode up there with some hickory and showed him what a “Broker” he’s really become! If this “one” is a representation of the masses then I think an extermination of all them roaches is in order! After all, I told him that I really just wanted to check the auto trader and see how it worked for me. He say’s NO don’t use that you’ll surely loose all of your funds soon because it’s not that good anyway and people are constantly loosing out with that thing. “WTF”!?!! Absolutely, the internet is littered with these fraudsters. White collar criminals are smart these days and use Casino marketing and good tactics to get your money. It usually starts with a minimum deposit. They will see to it you win a few trades…this gives you incentive to deposit more….they will add bonus money (which you should never take). Then boom your account is wiped out. They need a certain percentage of people to lose. A binary options brokerage is very different form Forex trading…where a Forex broker has no control of the pool of money. with binary options you are working with their capital as in Binary options the money pool is separate and under control of each brokerage…some regulated and others not. Many these are based out of places you would not believe….Israel for example is thriving on Binary Startups. There’s full of info on youtube with regard to this. I lost over 7k and….I am sure more people there are many who have lost more. BinaryBook stay away and clear. Good rule of thumb…if it sounds to good to be true is usually is. Saying that you are better off going to the Casino are taking a good vacation instead of dealing with there so called trader SOB’s. There is my experience. I have started with BinaryBook more tnan month ago. I decided to try Tauribot robot which recommended BinaryBook as a broker. I start with $501 and $500 bonus. I didn’t want the bonus, but Roger Wilson said that it will not a problem to withdraw my deposit. He is my broker now. He has traded very well and I deposited $10000 additional (22.02.2016). And I had $15992.59 after one month (see https://joxi.ru/4AkOzndtMGvaLA). I started avwithdrawal and got an approval on third day (see https://joxi.ru/12MQe9Xs4Oez42). I’ve got the first part $10000 (minus transaction fees) in my Canadian bank account 04.04.2016 (see https://joxi.ru/krD9qBdI068pxm, amount in Canadian dollars) and second one $501(minus transaction fees) on my credit card (see https://joxi.ru/EA4pKBEfD9gWLA). All in Canadian dollars by exchane rate on that date 1 USD = 1,2662 CAD. It is only first part of my story. Here is the second one. to get $10000 at my account. I did that (https://joxi.ru/KAx5YlyS4D5gRr). Roger made NFP trading on 03/06/16. Here is a screenshot https://joxi.ru/5mdWzLwcvMj4vr. As a result of that I’ve lost all my money(https://joxi.ru/DrlOzXLt4l8VaA). Does it a professional trade? It seems to me it is not. It looks like a theft. I had canceled to trade with Roger Wilson and BinaryBook. That is my sad story with BinaryBook. FYI I posted this back in July this year…….!! 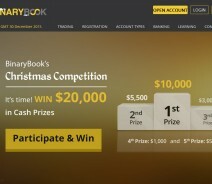 Binary Book are a broker you get with the NEO2 software scam. AVOID! if you accept their bonus with your deposit, be aware that they will require you to do … wait for it, i have it in writing from them … more than 60,000 (sixty thousand) trades before you can withdraw. run do not walk away. I am a private invetigator that work for a law firm that specialize in frauds/scams. We are currently working on couple of lawsuits against severals Bo companies. Full Name, Country, Skype or/and phone number and the of the BO company/ies you’ve been scammed by. There will be no fee for any advices needed.